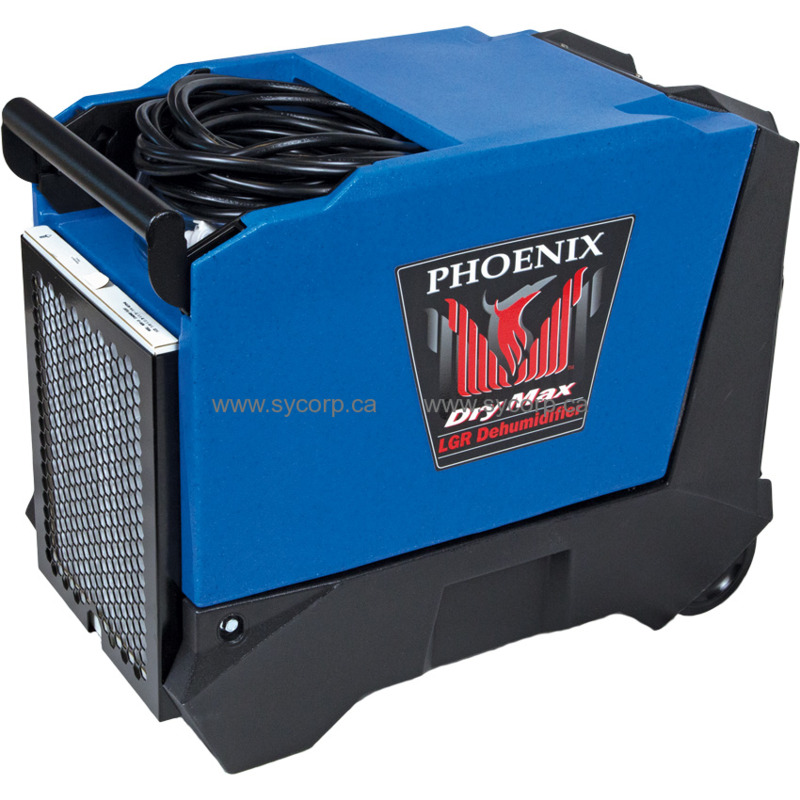 The Phoenix Dry Max is 6% smaller than the closest restoration dehumidifier in its class and yet it still has an integrated retractable handle and wheels, as well as onboard storage for the power cord and condensate hose! 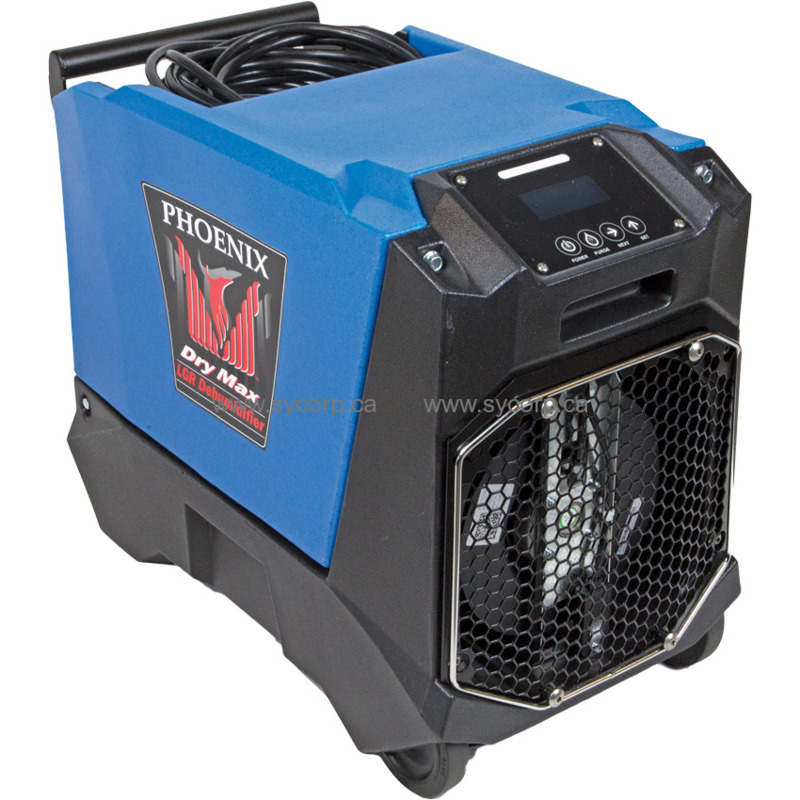 The ultra-compact design of the Phoenix Dry Max makes it the smallest “Large Category” LGR on the market today. This unit removes 80ppd@AHAM, uses only 5.7 amps, and weighs a mere 63lbs. 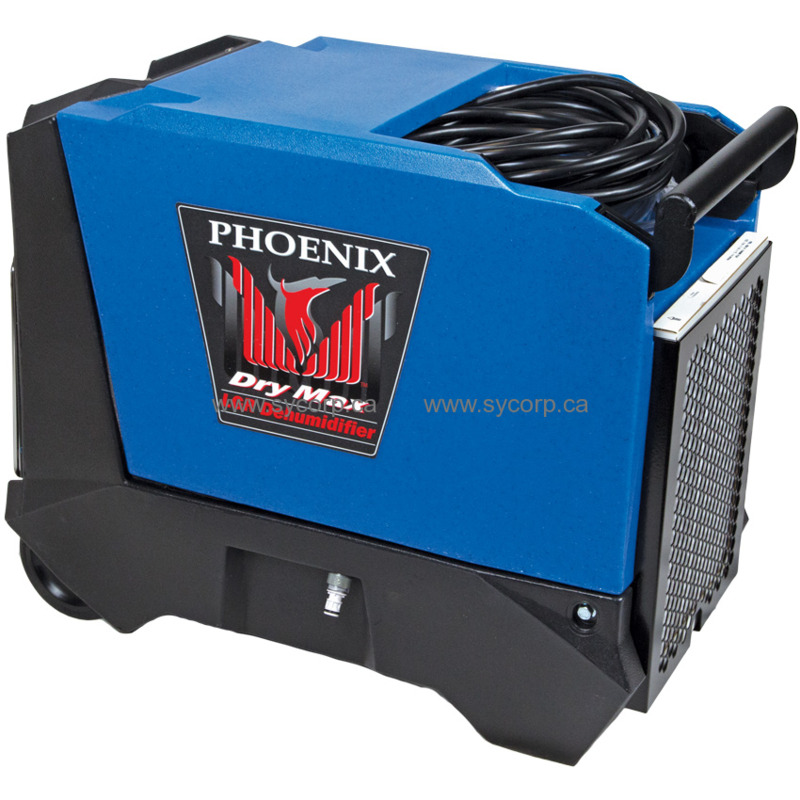 The Phoenix Dry Max has 170CFM of airflow and comes equipped with a heavy-duty condensate pump, epoxy-coated coils and superior MERV-10 filtration. 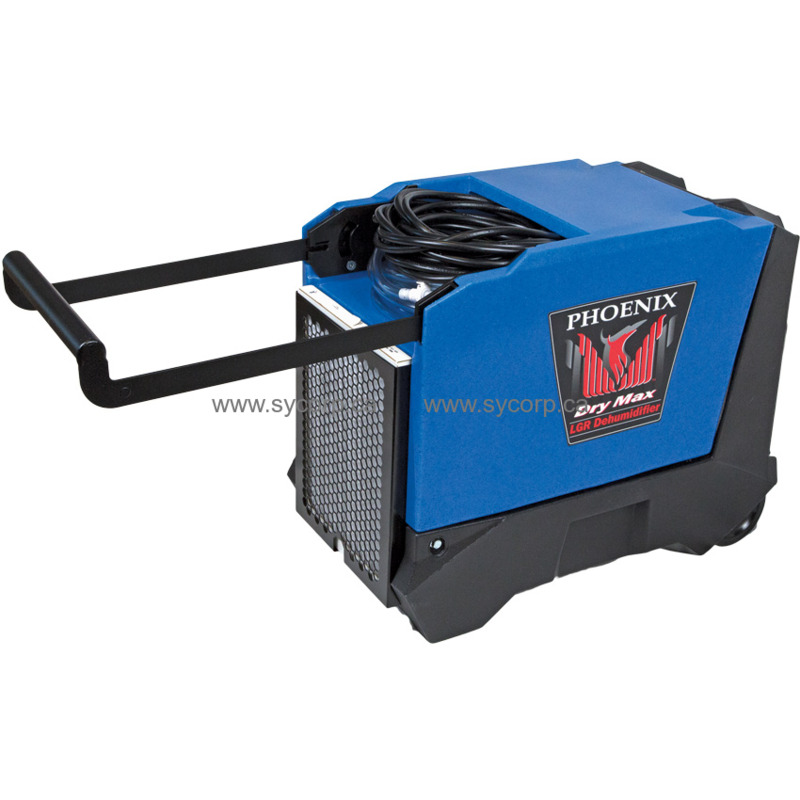 The all-new Phoenix Micro-Channel condenser allows us to pack so much performance into such a small dehumidifier. The Phoenix Dry Max has an advanced, customizable 4-line digital display, which shows all the information you will need right on the home screen. No scrolling through menus to find basic information. 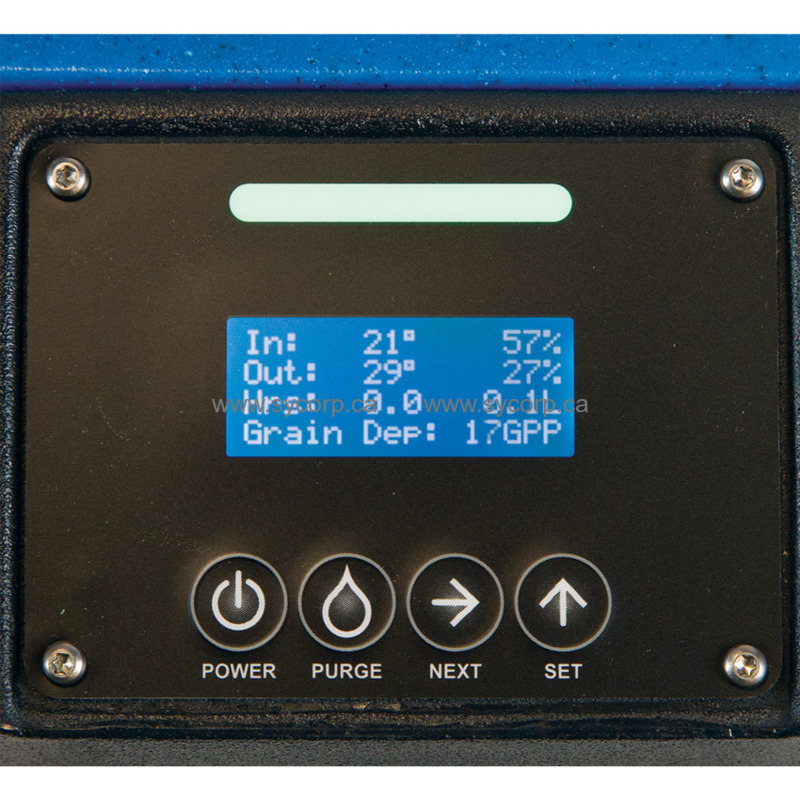 There is also a status indicator light on the control panel, which allows you to confirm at a glance that your drying job is proceeding as planned. Like our industry-leading AirMax, the new Phoenix Dry Max has been designed with superior stacking. Service on the Phoenix Dry Max is simple, you only have to remove four fasteners to have access to the inside of the unit. The Phoenix Dry Max pairs perfectly with our industry leading AirMax. Together these two innovative Phoenix products give you the smallest, easy to use, rugged, stackable, portable, drying solution on the market! Digital Display: New on this unit is its 4-line digital display. This customizable display can be individually configured to show the data you need to know on the home screen without requiring you to scroll through multiple menus. Control Panel: Press button electronic controls makes operating the unit’s power, purge, and navigating through its other functions easy. Wire Duct Collar: A wire duct collar is designed to allow a 10-inch lay flat duct to be connected to the exhaust. Onboard Storage: The pocket on top of the unit is built to conveniently store the 25-foot power cord and 33-foot condensate hose. Purge Function: Pressing the purge button will allow you to manually remove condensate water from the reservoir. Hour Meter: This meter displays the cumulative hours and job time the dehumidifier has been turned on to the tenth of an hour. Auto Defrost: The internal thermistor will cycle the compressor on and off and display the defrost cycle light when frost begins to build up on the evaporator coil. Float Switch: When the water reservoir is full, this switch turns off the dehumidifier to avoid overflow issues. Easy to Maintain: All of the unit’s main components can be easily accessed by removing just 4 fasteners.